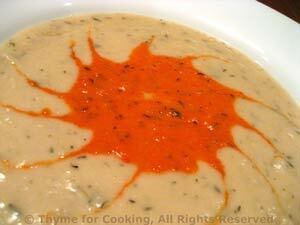 White Bean Soup, Red Pepper Coulis, Thyme for Cooking easy gourmet soup. This is a pretty soup as well as delicious.... and simple. Save the leftover Red Pepper Coulis for another use. Heat oil in medium sauce pan over medium heat. Add shallot and sauté until transparent. Add beans, chicken stock and thyme, cover and simmer 10 minutes. Remove 1/2 cup of chicken stock and purée the rest, either in blender or with wand blender. Check for consistency, add as much of the removed stock as you like (or more) to get desired consistency. Clean pepper and cut into big pieces. Add pepper chunks, thyme and chicken stock. Cover, reduce heat and simmer until pepper is very tender, about 20 minutes. Remove from heat and puree, using as much chicken stock as needed to make a thick sauce. Add tomato paste and mix well. Use 4 tbs for the soup, refrigerate the rest for another use. Carefully drizzle 2 tbs of Red Pepper Coulis on each serving, in a pattern or all in the center and use a warm knife to draw a pattern. It should float on top of the soup. Serve.